So after much reading of articles/guides (mainly on here, this site has been very useful!) I think I will have a redesign of my rat space. I wanted to tell you what my plan is, so you can tell me if it is a bad idea/if it needs improving. 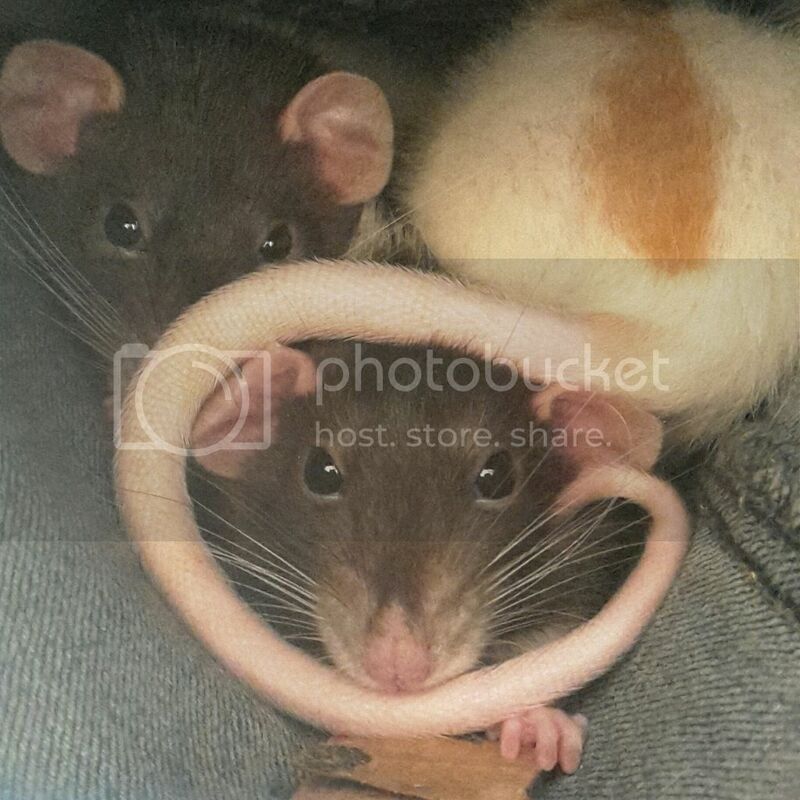 My rats are currently in a large (biggest I could get) cage in the attic (which is a room, not a storage space!). They are tucked in a corner next to a guinea pig run (I like to think they look from their hammock into the piggie cage and think 'wow! I can't wait till I'm that big! Though I'll miss my tail...'). This is fine and I'm happy with it, expect when it comes to floor time they have to be taken downstairs to our (sizeable) bathroom floor to have a run. This involves lots of catching and putting in carry boxes, and there are too many almost escapes for my constitution, plus I'd imagine the rats aren't enormously happy about being pulled out of bed and carted around. So! The plan is to rearrange the room a little, put them in another corner and use corex to make a fence, such that when I want to let them out I put the fence up and open the door, letting them come out on their terms (and go home on their terms). No chance of 'escape', as they would be escaping into the area I wanted them to be in anyway! It also means I'm not limited to 'this is floor time', I can go 'I have 15 minutes, I'll let them out for a quick jaunt' (rather than 'you look like you want to come out, but I need to make sure the bathroom is free, then catch you when you are giddy, then set up the bathroom etc...'. Much better if I can go 'fence up, cage open, have fun!'. We always need corex, so it will barely be an expense (the piggies cages are partly made of it) and would be easy to make a wall. I'm thinking about a meter high (to pass the '3 feet' threshold) and shall we say 2 meters long and maybe a meter and a half wide (these are rough figures). I can then have the rats in their cage, taking up no room, then build the walls as and when (this is necessary to avoid spouse complaints about me taking up too much room... ). As with most things I do, this would evolve and I'd spot issues and fix them, but as a basic idea, anything wrong with that? I feel (and I know this is stupid but...) that it seems... cruel? To have them in a cage, say 'yay come on out!' and let them into an area basically walled in. But I'm guessing the rats will see it differently, more 'wow look how big this walled in area is! I intend to fill the thing with toys, climbing frames and fun things to keep them amused. They can come and go from the cage as they like, presumably they will tire themselves out and go back to the cage to eat/drink/sleep (or get caught by me if I need them home after their hour is up). Sound good? Please do say if not! I want my rats to be happy and well adjusted, and I worry all the catching (especially if there is a fumble and a frantic reacquisition!) will be stressful, or might lead to issues. Better to let them come out on their terms, then go home or be caught on neutral ground while wide awake (than picked up out of bed when you aren't in a playing mood). One other thing, all floor time atm is around me, I sit on the floor and they run around and climb (and recently, nibble at me). Can floor time be 'human free'? Can I let them out as above then do some work/watch some TV, read a book (provided I keep one eye on them of course), or do they need constant supervision? I love my rats, but an hour every night sat in the bathroom will start to take it's toll (and if I work late, my wife won't sit with them; I bet she would put the fence up and open the door though). Lots of text! Thank you for reading! If any of that is cruel please be gentle with me, I don't mean it to be. I think that being able to have a run that doesn't involve carting your ratties about sounds good for all! Even if your run is smaller than the bathroom, if you keep it interesting and change toys/activities regularly I expect they will love it. My daughter's boys regularly pop back into their cage for a drink or a quick munch then resume play outside again. As you say, when they gave had enough, they take themselves to bed. Sometimes if they are out for one hour she will spend the whole time with them but mostly does a bit of both. Being in teenager mode, she is usually plugged in to music and listens to that/does her art/ homework etc at the same time. The boys come and go, having cuddles then going off to play again. She sometimes has two or three play times during one day and that is where it's easy just to open the door for them for half an hour or so. However just one thought....our boys are pretty jumpy that if I was to put a box/climbing frame in your run, they would gain height immediately and most probably jump on to the wall and off the other side! So take care not to put in anything too high! This time round I'm planning to attempt to rat proof the living room (where the cage will be) and have them free whenever I can be in there with them doing whatever I'm doing, probably playing with my son or watching a film etc, so they're able to choose to explore me as well as everything else. We'll see how it goes! And 3 new rescue girlies yet to be named! Naturenut wrote: However just one thought....our boys are pretty jumpy that if I was to put a box/climbing frame in your run, they would gain height immediately and most probably jump on to the wall and off the other side! So take care not to put in anything too high! I wasn't going to put anything near the wall or higher than maybe a foot, but the cage is 80cm tall and is basically a climbing frame itself! My latest idea is that I could put a lip around the top of the tank, so if they climb the bars they can't reach the roof itself. That way they would have to reverse jump from lower down the bars, gain over a foot in height and about a meter horizontal. Or put a collar around the top half of the tank, so they can climb a little but can't reach the top foot of the bars. Would they be eager to leap into the unknown? I'm confused, why are you mentioning a tank? Your free range pen idea sounds fine, a lot of people free range in a restricted area like that. Mine have their own room, but it's pretty small, so probably not much bigger in terms of area! I also think it's nice for them to be able to come and go from the cage as they like. Be prepared for escape attempts though - some rats see any kind of barrier as a challenge and will try and get over/around it! Athletic ones would also easily jump up 3 feet. I'm not sure about a metre, but I'm sure there are some out there who would manage it! But this may not matter too much if you're there to supervise and can retrieve any escapees. If your rats are currently very human-oriented during free range time, you probably want to make sure they get enough time with you. However if it means they get longer out of the cage, it's fine to leave them to their own devices for a while. I often sit and read a book while the rats run around - they can come and visit me, but I'm not actively playing with them. Not sure, I meant cage! I think my mind was muddled, the rats are all in a cage, no tank at any point. In case anyone is interested, I abandoned the whole 'free range around the cage' idea and instead transport the rats via a carry box to the bathroom, where they can lope about. I spend all the floor time with them, except at cleaning when I leave them alone. The barrier to stop escapes on opening the door is just over a foot and they hurdle it with ease (though never try and get through the door, so it's fine).